With that said here's my choice for number 3. 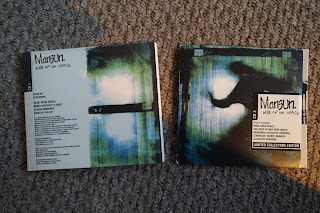 The first time I became aware of Mansun was when I picked up the CD single of "Wide Open Space". Whilst that song itself is a '90's classic, it was the b-sides that got me interested. Back when CD singles came in 2 versions this meant a potential of 6 more tracks. What I heard there, especially in "Vision Impaired", and "Skin Up, Pin Up" convinced me that I wanted as much music by this band as possible. Anticipation was high, then, for the debut album, "Attack Of The Grey Lantern" (AOTGL). Boy, did it not disappoint. You have to imagine yourself back in 1997. Oasis were the reigning kings of the the critics and the charts. A myriad of Gallagher brother wannabes were clogging up the pages of NME and Melody Maker. A few bands stood out as doing something other than re-hashing the Beatles back catalogue with louder guitars. Radiohead had shown two years previously with "The Bends" that they were headed in a different direction, but the genius of OK Computer was still 5 months away when AOTGL landed at number 1 in the charts. Suede had delivered a seminal work two and a half years prior with "Dog Man Star" but they were never the same afterwards without Bernard Butler. Reef and Kula Shaker had been number one, and a b-sides collection from Ocean Colour Scene hit number 4! The time was ripe for something different. From the opening to the,(apparently), ending strings it was clear that this was not going to be more tired retro re-hashes. Whilst the Fab Four influence is strong, there is so much more to this record. Taking not just the classic pop and rock stylings from The Beatles, as so many at the time were; but also the music hall and classical traditions that played such a large part of their work. A loose concept based on the titular hero , "The Grey Lantern" exposing the amoral behaviour in a northern town, tracks flow together showing the prog influences that became more pronounced in the follow-up "Six". "Taxloss" remains my least favourite song on the album, although seeing Paul Draper perform the album in it's entirety this year, I was struck how much more I enjoyed it live. Perhaps only "Egg Shaped Fred" sounds of it's time, and I wish live favourite, "Take It Easy Chicken" with it's David Bowie "Stay" style riffage was included. However having multiple versions of this on other discs mitigates this somewhat. Other than that the rest of this album is all highlights. "The Chad Who Loved Me" and "Dark Mavis" with their soaring strings stand out, in-between is a journey of styles and ideas hung over a framework of sing along tunes. Turning to the deluxe edition, this is clearly for the fans, including as it does the remastered album, a disc of BBC live sessions, a further cd of demos, rarities and outtakes and a DVD with a 5.1 mix, Hi-Res audio and videos. The extra discs are interesting for those like myself you enjoy hearing the genesis of songs, but the real bonus is the packaging and LP sized book that the music comes in. High quality and packed with photographs, live posters and flyers this is the real 'deluxe' part of the package. Looking through the pictures of tour posters to spot this gigs you were at brings the memories flooding back. A detailed history of the band's journey from three men with a drum machine to a number one album and a great live band is included, and fascinating. 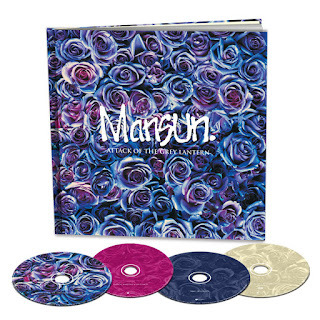 I wasn't as aware of at the time, or perhaps don't recall, the music press backlash to Mansun being a 'record company creation'. The reality was that the songs and got them a publishing deal before they'd even settled on a line-up, let alone played live. I caught them a few times in the '90s and was never disappointed. In conclusion this is a classic album, in a great package full of fan service. As a package it is great, as an album it merely hints at the greatness that was to come with "Six" .